Wednesday's swell dropped right back through yesterday with fun waves across the South West in the 3-4ft range, 1-2ft in Mandurah and tiny around Perth. This morning the surf is smaller again and only surfable on the magnets across the South West. Just a small shout out to Monty - best of luck for your wedding this afternoon legend. The coming weekend isn't looking too flash, mainly owing to the winds remaining less than favourable and from the S/SE on Sunday with our new S/SW groundswell. Tomorrow, the surf will remain small with background swell energy providing 3ft waves on the magnets across the South West with a morning SE breeze. Perth and Mandurah will be tiny to flat. Sunday's S/SW groundswell is still on track, with a strong polar low forming south-west of us yesterday generating a good but fast moving fetch of severe-gale to storm-force W/SW winds in our southern swell window. The low linked to this swell is now just east of our swell window, with the groundswell on the way towards us. We should see it kicking late tomorrow and peaking Sunday morning to 4-5ft+ across South West swell magnets, tiny in Perth and Mandurah. As touched on just above, winds are still less than ideal for spots seeing all the size with a morning S/SE breeze, tending S/SW-SW into the afternoon. Monday looks to offer similar winds and conditions with a morning S/SE breeze but small fading surf from 3ft+ across the South West swell magnets. 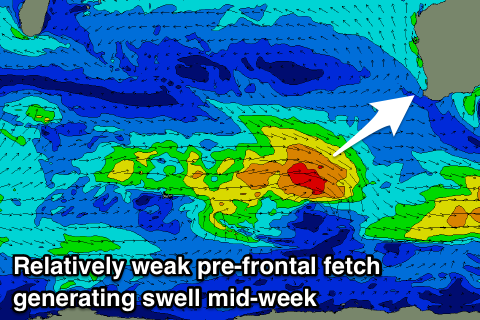 A small bump in swell is due on Wednesday, generated by a pre-frontal fetch of strong to gale-force W/NW winds moving in through the south-east Indian Ocean Sunday, with a post-frontal W/SW fetch Monday and Tuesday south-west of us. The swell will be mid-period and build late Tuesday ahead of a peak Wednesday to 4-5ft across the South West, 1-1.5ft in Mandurah and 1ft in Perth. Winds look better and offshore out of the SE, stronger S/SE into the afternoon. Longer term a couple more mid-period swells are on the for late next week and into early next week, but it's generally looking quiet. A wedding! Coinciding with Gary’s tour of the South West! In preparation for his big night out tonight Gary already has appointments to get his hair and nails did, so hopefully this Monty character is a likeminded groom and old Gaz will intersect with him and score an invite. Gary really puts the Man in Manicure. My regards to Creed 30 10 89. And to all you who put your life on the line out there at main break. Take offs on those fast moving heaving peaks is an amazing art form.